Q: I’m not sure I will fit in because of what I believe, or my lifestyle, or my background. Will I be welcome at Peace? A: You are not alone in wondering whether you’re welcome in church. A lot of people ask the same thing. Some of us at Peace wondered about this, too, yet we found a home here. So, if you doubt, you are welcome. If you’ve never been to church before, you are welcome. If you didn’t grow up Lutheran or are not baptized, you are welcome. If you’ve made big mistakes in your life, or if you’re living in a way you think ‘Christians’ wouldn’t approve, you are welcome. You are welcome here because the Jesus we follow didn’t reject anyone. We don’t either. Our welcome is open to all. A: Folks living in the Sierra foothills tend to be pretty casual in general, but you will see all manner of dress at our worship services. Some people dress down, and others like to dress up. Our 8:30 a.m. worship is more casual, but you will see people wearing both shorts and suits at both the 8:30 and 11 a.m. services. Q: Can I attend Bible study and church activities if I’m not a member of your church? Q: Do you have a mentoring program linking members and new attendees to “show me the ropes” of what’s available at your church? A: Yes. When you come on Sunday, ask the friendly greeter inside the lobby. Q: I have a hard time going up steps. Is there a different way for me to access the church? A: Yes. We have double doors at street level on the west side of the building, and several handicapped parking spaces nearby. When you come into the parking lot, drive to the right along the length of the building to the end, then turn left to go back around toward the street. You will see the handicapped spaces and street-level entrance to the lobby on your left. Q: Can I bring my service dog? Q: Can I take Holy Communion? A: Anyone who is baptized is welcome to receive Holy Communion. If you have not been baptized, or if you just don’t want to take the Sacrament for any reason, you may go up to the altar with everyone else, but cross your hands over your heart to indicate you want to receive a blessing. Children especially are welcome. Q: How do I act during Holy Communion? A: The ushers will indicate when it is the turn for those sitting in your area to go to the altar. You will receive the bread (really, a thin wafer) in your hands, then you will dip it into the wine chalice when it is presented to you. Just watch what everyone else is doing, they’ll be glad to help you. Q: Can I get baptized, or have my child baptized at PEACE? A: Yes! We would love to take you through the steps of getting you or your child baptized. Please speak to the pastor about it, or ask an usher for help. You will be invited to learn more about what it means to be baptized and to live out your baptismal calling. Q: I want to get married in Grass Valley. Can I use Peace Lutheran Church for my wedding and/or reception? A: Yes. Please contact the office. Q: Can outside organizations use the meeting rooms at the church? Q: What do Lutherans believe? A: Lutherans believe in the Triune God: Father, Son and Holy Spirit. Lutherans believe Jesus is their Lord and Savior. In preaching and teaching, Lutherans trust the power of the Gospel (Jesus’ “good news” of forgiveness and new life) as the power of God for a right relationship with God for all who believe. Lutherans practice and rely on “grace,” God’s free gift to all believers. Receiving God’s grace does not depend on what we do, but on our faith. Lutherans do not have the answers to every question about faith, but Lutheran teaching and understanding of the Bible prepares believers to live out in this life the rich gifts God has given us. Q: Who is Martin Luther? A: Martin Luther (1483-1546) was a contemporary of Christopher Columbus and Michelangelo. He was a Catholic monk and faculty member of a new university in a small town in Germany. Part of Dr. Luther’s faith journey had to do with his search for a “righteous God.” He felt his sin was a barrier to God’s love. However, Luther became “captivated” with the Bible, especially St. Paul’s letter to the Romans. In it, Luther discovered this clear message: Our merciful God sets us right with him through the free gift of Jesus and our faith in Jesus. Our rightness with God depends on God’s work, not ours. This understanding was a turning point in Luther’s life. His efforts to “reform” and “renew” the Catholic Church became the beginning of what is known as the Reformation and eventually the beginning of Protestantism, of which the Lutheran Church is a branch. Q: What is the Luther Rose or Luther Seal? Despite the pain of the cross, the heart remains alive and vibrant because “the just shall live by faith …. in the Crucified One.”(Romans 1:17) The white rose shows “that faith gives joy, comfort, and peace… This faith does not give peace and joy like the world gives” (John 14:27). That is why the rose should be white and not red, for white is the color of the spirits and the angels. Q: What does “Christ” mean? A: The Bible uses the Hebrew word “Messiah” and the Greek word “Christ” to describe God’s “anointed one,” the person God sent into the world – Jesus – to show his great love for all people. Q: What is the Kingdom of Heaven? A: Jesus told many stories to explain what the Kingdom of Heaven is like – it’s precious and it’s everywhere! You can read these stories in the Gospel of Matthew, chapters 13 and 14. Lutherans believe it is both a way of life in this world and a place where we will live with God forever in the next life. Q: What is the ELCA? A: The Evangelical Lutheran Church in American resulted from the merger of three Lutheran churches in 1988. 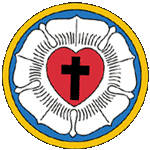 Those organizations were the American Lutheran Church, the Association of Evangelical Lutheran Churches and the Lutheran Church in America. Q: What is the Sierra Pacific Synod? A: The Sierra Pacific Synod is one of 65 geographical jurisdictions within the Evangelical Lutheran Church in America (ELCA). “Synod” comes from a Greek word meaning “to travel a common road” or “to walk together.” Nearly 200 congregations in central and northern California and northern Nevada, including PEACE Lutheran, walk together in the SPS.